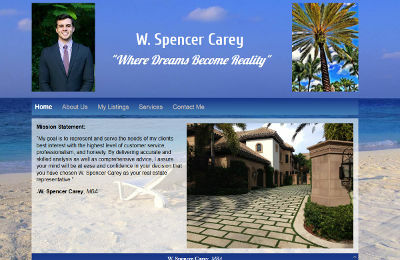 W. Spencer Carey, a licensed Realtor serving the Palm Beach County, FL area, contacted us on Sunday in regards to creating a personal website for him. He wanted to have a site where he could list his own properties that were brokered by him – in addition to some other general information about his background and the services he provides. Spencer took care of the initial deposit on Monday and we got started on his website right away. After several modifications, color changes, and other updates, he has just approved of his website! We appreciate the business from Spencer and hope that we have exceeded his expectations to the point where he refers others to us! Spencer’s website is at wspencercarey.com.